The majority of large-scale applications we tend to create will usually have multiple views be kept in different routes. Today, we'll discuss client-side routing and set up the starting point of the routing application we'll build. Most large-scale applications we use today tend to have multiple views be separated and kept in different URL routes. For instance, an application might have a login view where a user can log in or a search results page that shows a user a list of their search results. These are two different views with two different page structures. 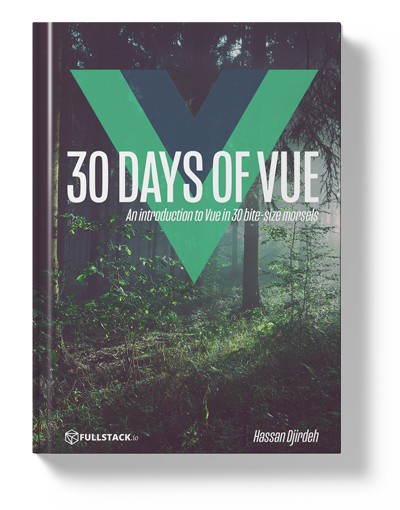 In today's and tomorrow's article, we'll discuss and build an application that has multiple views with the help of the Vue Router library. The app we'll build will be an adaptation of an application first built as part of the Let’s Build a Custom Vue Router article originally posted on CSS-Tricks. First and foremost: let’s define routing for those who may be new to the concept. In web development, routing often refers to splitting an application’s UI based on rules derived from the browser URL. 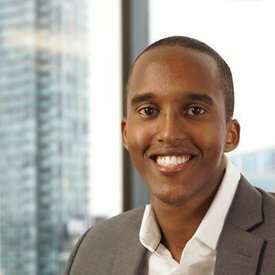 Imagine clicking a link and having the URL go from https://website.com to https://website.com/article/. That’s routing. Server-side routing: the client (i.e. the browser) makes a request to the server on every URL change. Client-side routing: the client only makes a request to the server upon initial-page load. Any changes to the application UI based on URL routes are then handled on the client. All the apps we’ve built in this course have all been limited to a single view. By the end of tomorrow’s article, we’ll look to have constructed a simple Pokémon routing app that displays details of a particular Pokémon based on the URL route. 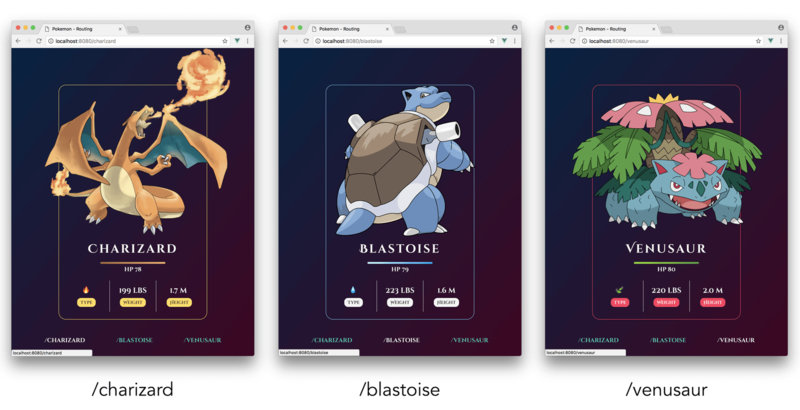 The application will have three unique URL routes: /charizard, /blastoise, and /venusaur. Based on the URL route entered, a different Pokémon will be shown. Footer links will exist at the bottom of the application to direct the user to each respective route upon click. We could build this application without the need of routes and instead use a simple parent-child component hierarchy that uses props to dictate the information that should be displayed. 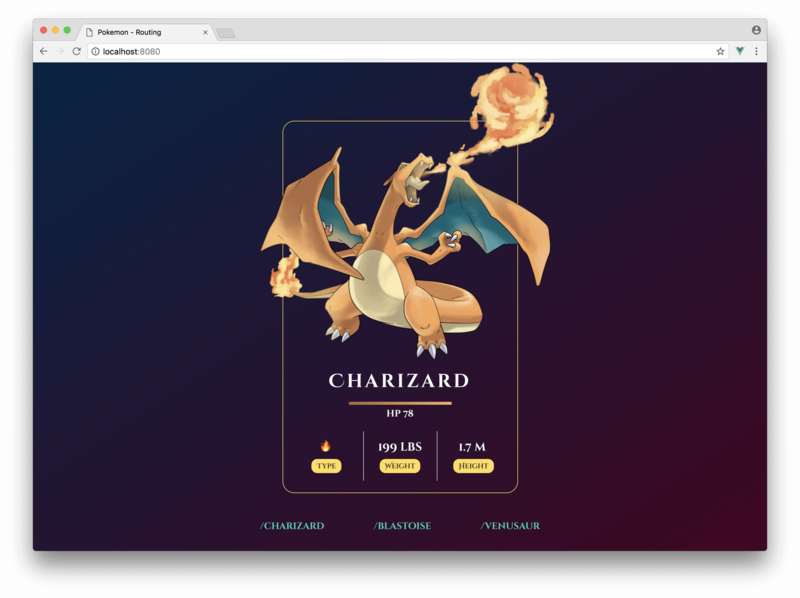 You can see this in the Codepen example here: Pokémon App - Props. Though the props version of the Pokémon app works, it misses a substantial feature that’s expected from most web applications - responding to browser navigation events. We’d want our Pokémon app to be accessible and to show different details for different pathnames: /charizard, /blastoise, and /venusaur. This would allow users to refresh different pages and keep their location in the app, bookmark the URLs to come back to later, and potentially share the URL with others.